Anyone who has followed my writing since 2010 knows that I am a very strong proponent of of filibuster reform. I am especially proud to have volunteered for the campaign of the man who has taken the lead in pushing to reform the filibuster, Oregon�s Senator, Jeff Merkley. I could not be more pleased that Elizabeth Warren has opted to join Jeff and make filibuster reform her first priority, and I urge you to join the struggle. Noted and signed filibuster petition. Thanks, TomCat! Signed and shared on Twitter, thanks Tom. This is essential to Congress getting anyone done. Hopefully though we don't see a repeat of the ridiculously lengthy speeches as was done in the past to filibuster... reciting the Declaration of Independence, George Washington's Farewell Address, etc. We do have some windbags in the Senate! 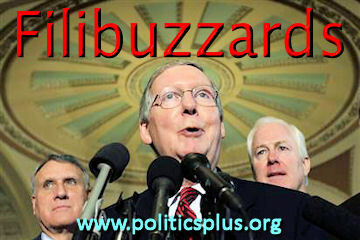 "reform the filibuster" petition gladly signed! Thanks Tom signed for myself and my husband also shared already. Thanks Tom for the post and the Maddow segment. You are right there should be no opposition the the reform from other democrats. hats off to Elizabeth for her support on this. Read, viewed and noted. I signed the petition yesterday. There's that picture again of McConnell getting a wedgie again from the 2 goons behind him, and apparently liking it! The blood flow to his male brain must be cut off so he can't filibuster anymore! The filibuster was used 380 times in the past since 2006. I think it needs to go, and it is time for some leadership on this. Lord knows, Harry Reid hasn't been able to give that leadership. I signed Elizabeth's petition for Filibuster reform that came in an email this morning. It's insane that these jerks can simply "phone in" an objection & cause a bill to die by neglect � but it IS a Very RepubliCON way of doing things! agree, reform the filibuster...petition signed. Signed and noted. Thanks, Tom! Gladly signed to stop the Repugnants' choke-hold on the Senate! "The Democratic argument in opposition to filibuster reform is this. If the Republicans take back the Senate, this will impede our ability to block their most heinous proposals and appointments. This is wrong for two reasons. First, as Republicans have proven for the last four years, the governing party must be able to govern, even if we disagree. Republican abuse of the filibuster has given us four years of minority rule in the Senate. Second, you may be absolutely certain that if Republicans ever gain control of the Senate again, they will kill the filibuster without the slightest hesitation, so there remains no valid reason not to reform it now." TC - as always you have said it far, far better than I could - thank you! Wish I could sign to support this vital issue. Thanks and kudos to everyone who signed and everyone who wanted to, but couldn't. To avoid vonfusion, the action link in the article, and the link Jim posted here are the same link. Signed both, noted and shared on FB and in private email.